The Hoover building was derelict and empty. 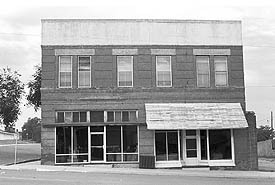 It had once been the home of attorney's offices, a doctor's office, and a corner drug store. However, through the years, the building had fallen into disrepair and had become an eyesore. 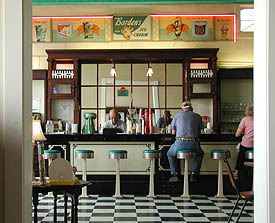 It was bought by a person who planned to create an old-fashioned soda fountain. Alley Woodworks provided oversight of the building's renovation. We did the demolition, carpentry, cabinetwork, and millwork. All windows and doors were rebuilt, built on site, or built in our shop. 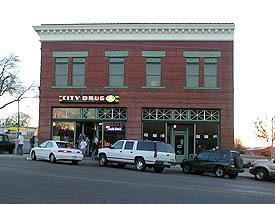 The owner had located old soda fountain fixtures in a building in a nearby town. These fixtures were restored and installed. 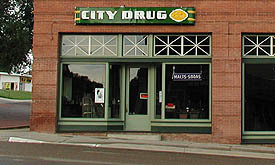 City Drug is now a popular soda fountain and gift shop. The Hoover building before renovation.